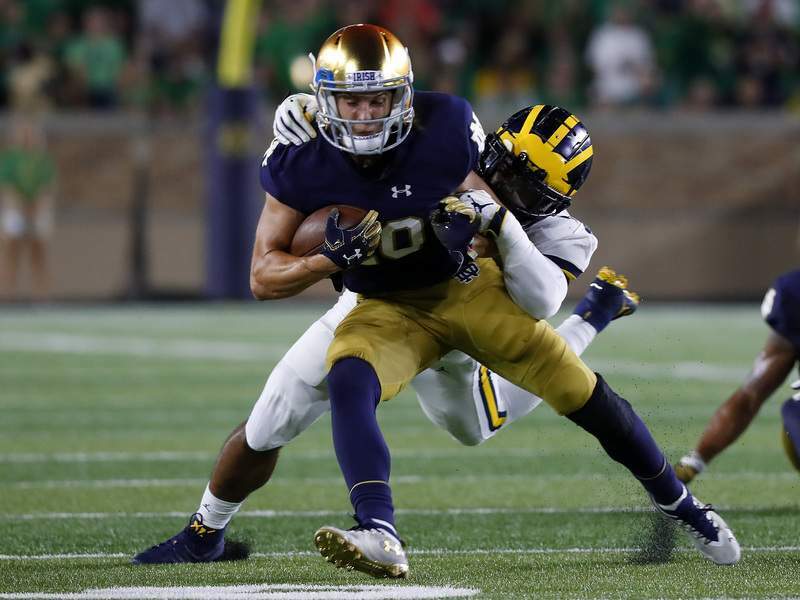 Associated Press Notre Dame wide receiver Chris Finke had three catches for 55 yards against Michigan, including a 43-yard, highlight reel-making touchdown grab off a Wolverine's helmet. SOUTH BEND – Chris Finke untangled himself from a pair of Michigan defenders and stood up with the football palmed in his right hand as Notre Dame Stadium convulsed around him. The receiver had just scored his first touchdown since 2016, a 43-yard reception that he pulled down off the helmet of a perfectly positioned Michigan safety in the first quarter Saturday. To celebrate the play, Finke walked like a pigeon. The unusual touchdown dance referenced an inside joke between Finke and his brother after they'd seen pigeons on a visit to New York. He thrust his head forward and his hands back like wings, still holding the ball as he waited for his teammates to arrive. The move immediately lit up Twitter. The play that led to the celebration was the culmination of three years of hard work for the 5-foot-10 redshirt junior, a spectacular catch that served as the first big play on the national stage for a former walk-on who figures prominently in the Irish's plans for their offense this season. After the game, there was some disagreement over whether Finke would have been able to make the catch in the past. Finke politely disagreed with his coach, though he tried to remain diplomatic. Coach and player would agree, however, that Finke making ESPN “SportsCenter's” Top 10 plays was unlikely four years ago. Notre Dame coaches only saw him play in high school because he was on the same Archbishop Alter team as current Irish safety Nick Coleman. Finke didn't expect to even play college football going into his senior year at Alter. When Kelly offered him an opportunity as a preferred walk-on, Finke had no Division I FBS scholarship offers, only similar walk-on chances from schools such as Wisconsin and Pittsburgh. When Kelly extended his offer, Finke was so shocked, he gave a less-than-enthusiastic response. The Irish coach was surprised and the receiver had to enlist Coleman's help to convince Kelly he was interested. “(Kelly) had an in-home visit with Nick that night, so at basketball practice with Nick I was like, 'I blew it, you've gotta tell coach that I'm excited about this,'” Finke said, laughing. Finke arrived on campus in 2015, but his Notre Dame career got off to a rocky start. In fall camp, cornerback Shaun Crawford tore his ACL and the Irish briefly switched Finke to defensive back to add some depth to the position. Finke called it his toughest time at Notre Dame. Finke leaned on his family and Coleman to help him through the weeks he spent on defense and eventually found himself playing offense again with the scout team as the team red-shirted him. He performed well enough there to earn a scholarship after his redshirt year. The long-haired, baby-faced receiver spent most of his time on special teams in 2016 and 2017, but also made 16 catches for 224 yards and two touchdowns. Heading into this season, he locked down a starting spot in the slot and made three catches for 55 yards against the Wolverines in Week 1. His long touchdown catch was no surprise to his fellow receivers. Boykin didn't predict the pigeon walk celebration, but he and Irish fans could have plenty of opportunities to get familiar with it this season.